Death in the Fast Lane. In late 1996 this top-down racing game took all by surprise with it's addictive nature and excellent gameplay. A nice Truck Racing game sponsored by Renault and made by Game Seed Studio. Drive the 1100 hp Renault Premiun DXi13 against 15 opponents endowed with an awesome artificial intelligence. Accessible to all with ultra realistic driving, TRUCK RACING by Renault Trucks asserts itself as the most exciting truck racing game ever made. Compete in engaging races for car parts, medals, and above all else, fame! Players can race in head to head challenges, participate in team races, or establish the fastest racing time to declare superiority. 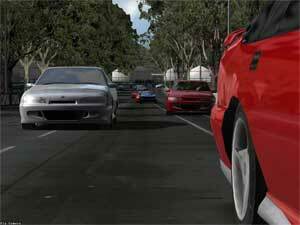 Driving Speed 2 is a free high quality racing game for your PC. Choose from four high powered V8 muscle cars and race against up to 11 computer controlled opponents on two touring car circuits. This game has realistic graphics, realistic car physics and performance, high quality sound and AI. Play against your friends over a LAN or internet with 8 player Multiplayer. Send your fastest lap records to the online lap records where you can see your times against players from all around the world. The latest version of Driving Speed is version 2.0.7 which was released in September 2009.